There is a symphony outside this morning. The loud bass of the highway traffic and the soprano of a choir of crickets. While it may be a soprano song, it is the males who chirp in order to attract a mate. Male crickets make their chirping noise by rubbing their wings together - and their ears are located on the knees of their front legs. In some Asian countries crickets are believed to bring good luck and they are kept in tiny cages as house pets. In Brazil, their singing is believed to be a sign of impending rain. In other cultures, crickets found in a house are believed to be there to announce a death. We can expect to hear the crickets until the cold weather, almost a month of the cricket symphony at our doorsteps. Here are a few jokes on the insect theme. Q: What is a bugs favorite sport? Q: How do bees brush their hair? A: With a honey comb! Q: "Waiter, what's this fly doing in my soup?" A: "I think it's doing the backstroke!" A: On the school buzz! Q: Did you hear about the two bed bugs who met in the mattress? Q: How do fireflies start a race? Q: Where do most ants live? Q: When do spiders go on their honeymoon? A: After their 'webbing' day! Q: How do fleas travel? Q: What do you call a bug that can't have too much sugar? Q: Why couldn't the butterfly go to the dance? A: Because it was a moth ball! Q: What did one flea say to another? A: "Should we walk or take the dog?" Q: What do moths study in school? 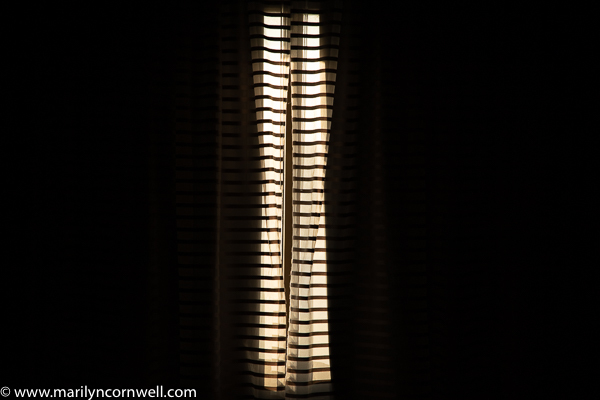 Our image today: an abstract of the curtains in our hotel room.